Small Kitchen College » Fourth of July: Blue Food! Fourth of July: Blue Food! It’s summer, and that means colorful summer fruit. Just in time for the Fourth of July, our favorite blue fruit emergies: blueberries. Cara is the co-founder of Small Kitchen College and Big Girls, Small Kitchen. This cream lies on the softer side of whipped cream, and it’s made slightly tangy by the addition of sour cream and lemon zest, which complements the blueberries perfectly. 1 tablespoon chopped toasted walnuts. Rinse the blueberries and pick out any soft ones. Set them aside. Beat the whipped cream with the sour cream, lemon zest, and confectioners’ sugar. You want it to be thickened, but not overly fluffy. Set aside. Toast the walnuts in a small dry frying pan, tossing occasionally, until fragrant. Cool, then chop and set aside. Arrange the cream in two small bowls. 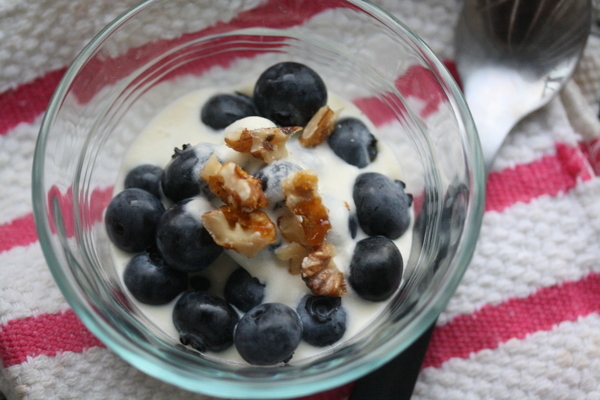 Top each with half the blueberries, then sprinkle with the walnuts. Serve immediately.